Some time ago Richard Bruce, whose health has been profoundly damaged by pesticides, highlighted the lack of reference to “the poisons that are added to the wheat AFTER harvest, in the food grain stores and during processing”. He continues: “Here in the UK tons of the poisons have been admixed with wheat, barley, oats and other food crops every year for decades, often with no withholding times after treatment at all. The EU intervention stores demanded that the grains were protected from insect infestation by these products for at least 5 years in store … Bakers have refused delivery of clean wheat unless it is treated with the poisons”. Richard pointed out that though the British Medical Association stated in the publication ‘Pesticides, Chemicals and Health’ * (use link below) that wholemeal bread contained the highest residues of the poison – 24 years later it is still approved for use in our food and NEVER appears on the food content labels because it does not have to be declared. The official reason? Because it is classed as a pesticide and not a food additive. Purdey refused, arguing that the suggested dose was far too high and in any case his natural treatment for warble fly was perfectly effective. The battle lines with the agricultural bureaucracy were drawn; before they had a chance to prosecute him, Purdey took MAFF to court and shook administrative complacency by winning his case. He suggested to Richard that modern farmers have been treated rather like the Hitler Youth – indoctrinated into dependence on chemical inputs and forcing the land into submission from birth. They know no different and are reluctant to change. This coupled with the induced fear of crop and livestock losses through disease convinces them never to change. Richard ends: “If my efforts to gain justice and truth through the courts taught me anything it is that none of the experts can be trusted. It appears to me that too many of them simply repeat what they are taught and told without ever checking the facts for accuracy. We see it all the time, even when the claims made have been proven to be false”. Seattle (Washington State USA) is one of 17 American states to have “pesticide free parks”. It has fourteen, maintained by Seattle Parks and Recreation department without the use of any pesticides since 2001. IPM practices are used and their parks are not overrun with fire ants or other pests. Read in more detail here. The program is now being expanded to include eight more parks and about 25 more acres, making a total of 22 parks and about 50 acres distributed geographically throughout the city which provide citizens with an opportunity to use these facilities with the knowledge that no pesticides are used. And in France on 29th December it was reported that pesticides will be banned in all France’s public green spaces and non-professional gardeners will no longer be able to buy pesticides over the counter. The pesticide ban covers public forests, parks and gardens, though local authorities are still allowed to use pesticides in cemeteries. The new law also stipulates that pesticides will be prohibited in private gardens from 2019. Richard Bruce recently sent an email reflecting on the Queen’s opening of the £700 million Francis Crick Institute (below), which will have some £130 million in annual funding. Its aim is to find new ways to prevent, diagnose and treat conditions such as cancer, heart disease and stroke, infections and neurodegenerative conditions like motor neurone disease. It is the biggest research building under one roof in the entire European Union employing some 1500 scientists and staff. The Medical Research Council (MRC), Cancer Research UK, Wellcome, University College London, Imperial College London and King’s College London are involved. Richard comments: “Some interesting names there with staff who must know what is really going on” and summarises his post examining what the MRC actually knew and what it has reported over the decades. The Francis Crick Institute in London is said to be “a world-leading centre of biomedical research and innovation, it has scale, vision and expertise to tackle the most challenging scientific questions underpinning health and disease. Richard’s post states that the cause of these illnesses is already well-known and has been known for a very long time but nothing is done to remove those causes. He says that protecting the poisons industry seems to be the real aim: “Poisoned people earn the industry £millions in drug sales and research”. “Sorry to begin the new year as the last one ended but it is with sadness that I have to report that John Hill died from OP poisoning on Sunday“. “Despite equipment to supply oxygen and to help him remove the carbon dioxide from his lungs he was admitted to hospital where he contracted the fatal pneumonia. Doctors say that the OPs were still working in his body and as a result he was unable to rid himself of the carbon dioxide or utilise the oxygen, despite the equipment provided. 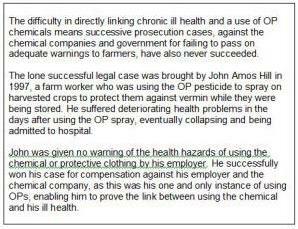 “John and his wife were put through hell by the lawyers, doctors, and the court process where he was told that his symptoms were prolonged not because of the OPs but because of his mental state, which resulted in his compensation being greatly reduced. Even his long-standing peripheral neuropathy was denied by people who should have known better. As he said he could not even feel his fingers when searching for items in his pockets and was still forced to use a wheelchair despite the false claims that his nerves had recovered. “Do not believe those experts who tell us that the OPs leave the body quickly – they become embedded into our very being because of their nature and are transported from cell to cell just as other natural phosphorus compounds are – protected from breaking down by chemicals in the formulations. “At least John has now escaped the torture forced upon the victims of OP poisoning by dishonest doctors, psychiatrists, State Benefit medical examiners – and the politicians who drive them all and sanction the criminality. “May John rest in peace at last – and may his sacrifice and that of his close family not be in vain“.